Thank you for your interest in Misty Morning Cottages! 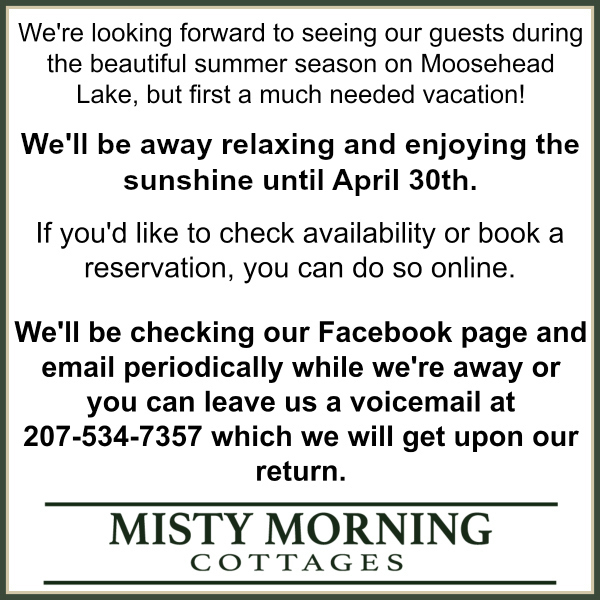 We look forward to having you stay with us in the beautiful village of Rockwood, Maine. You can book a reservation online for any of our 6 cottages below. Book a Reservation for our Pet Friendly Cottage One HERE. Book a Reservation for our Pet Friendly Cottage Two HERE. Book a Reservation for our Pet Friendly Cottage Three HERE. Book a Reservation for our Pet Free Cottage Four HERE. Book a Reservation for our Pet Free Cottage Five HERE. Book a Reservation for our Pet Free Cottage Six HERE. Hi Joe sorry I didn’t get back to you but due to the fact of being busy gearing up for spring launch season and not enough people to commit we are going to have to cancel the tripe up this weekend. sorry but people are dragging there feet.